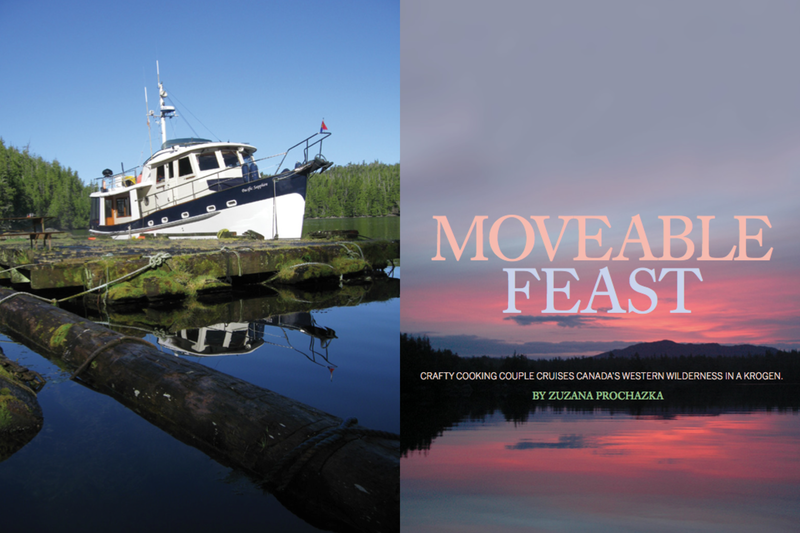 My mouth watered as I thumbed through the 250 pages of Cooks Afloat, a cookbook and how-to guide for living off the land (and waters) of British Columbia’s seaside paradise. I was waiting for the book’s authors—David Hoar and his wife, Noreen Rudd—to finish up with an aspiring chef and potential book buyer at the Vancouver Boat Show. Sesame-encrusted halibut or pears with curried crab—I couldn’t decide. How, I wondered, could I get myself invited aboard for dinner? 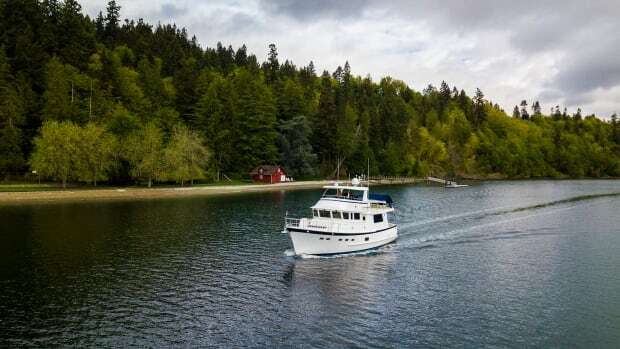 David and Noreen craft their culinary creations aboard their 1988 Krogen 42, which they cruise five months out of every year throughout the Pacific Northwest and up to Alaska. 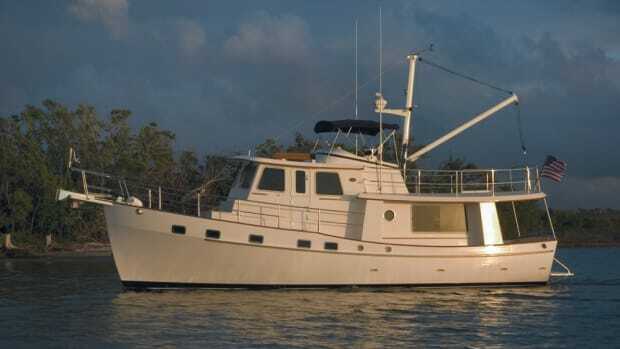 Pacific Sapphire is hull number 147 of the model that launched the company back in 1977, when Art Kadey and Jim Krogen got together to design a full-displacement trawler. By 1998, 203 hulls had been built. David and Noreen in front of Pacific Sapphire. 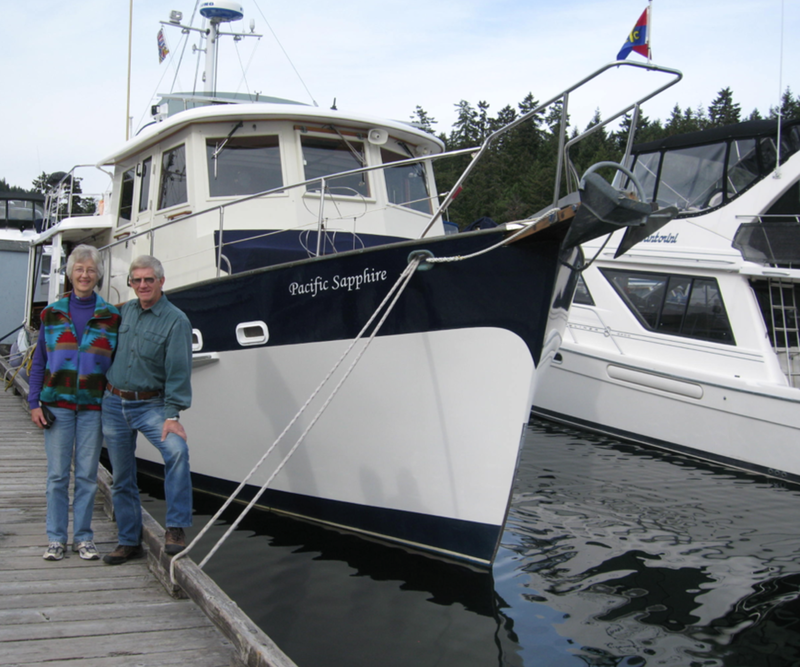 When they bought the 17-year-old 42-footer, David and Noreen were stepping up from a Pelagic 40 trawler. They were no newbies to rugged northern cruising, and they knew what they wanted out of their next boat. A little more room was good, but they needed a boat that wouldn’t take up too much space at docks that are crowded in the short summer season of the Northwest. They also wanted a vessel that would be self-sufficient for long periods of time, that would be seaworthy in unpredictable weather and that would have easy access to the water for fishing. 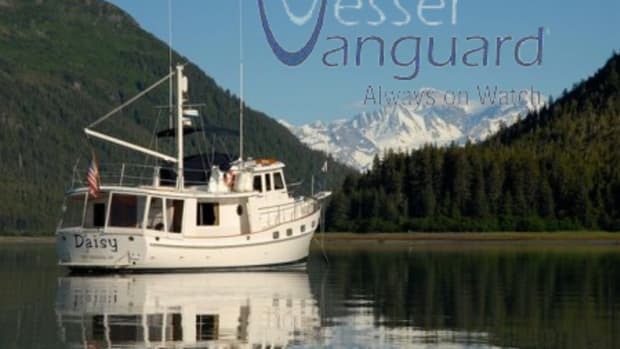 Most important, they needed a boat that was easy to anchor and would stay put in the crazy currents and 60-knot gusts that can sweep remote anchorages for days at a time. PHOTO GALLERY: Click here to see more Pacific Sapphire! Kadey-Krogen Yachts is headquartered in Stuart, Florida, but the boats are built in Taiwan, and given how prolific the design has turned out to be, it wasn’t hard to find one on the West Coast. The hull is solid glass below the waterline and closed-cell PVC foam above, with mahogany stringers and frames. 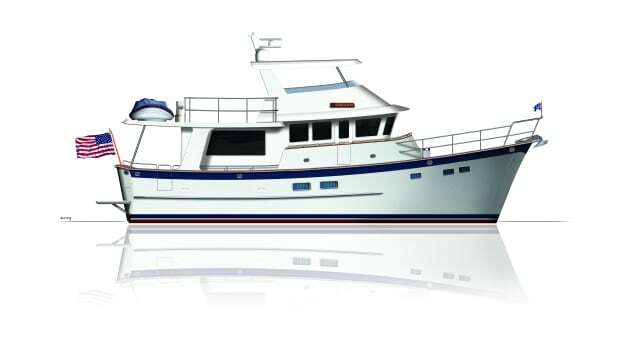 The 42 has a fine entry and a wineglass transom, and although it can get a bit roly without stabilization, many of these hulls have crossed oceans, so the model passed David’s seaworthiness test. The flybridge provides a covered afterdeck, which is perfect for a sundowner cocktail with hors d’oeuvres in the cockpit, and there’s plenty of room on the bow to work with the windlass and a pair of anchors. There’s even an athwartship seat molded into the forward face of the raised pilothouse, which provides a lounging place along with extra storage. Much like a good sauce starter, the Krogen 42 held promise but would need modification to become the signature dish. David is a retired geneticist and molecular biologist, with the skills of an engineer and the heart of a sailor, and he set about making the boat a self-sufficient home, since he and Noreen would be living aboard for the first five years of ownership. 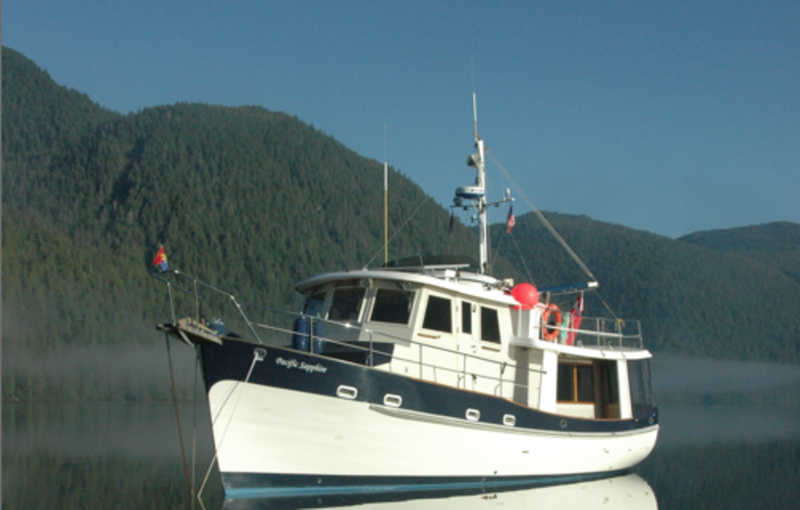 Pacific Sapphire tied-to in the Smith Inlet, British Columbia. “The key to cruising is quiet,” says David. “Not only for your own sanity but to not scare away the wildlife you’ve been waiting half a day to see.” In his quest for quiet, he describes one of the most important projects he tackled in 2006. 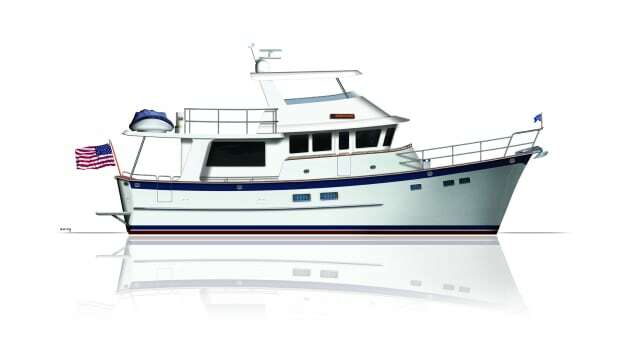 Like most motoryachts, the Krogen 42 was heavily dependent on the genset, which made noise, not to mention ate up precious fuel. So David replaced the 110-volt electric stove with a propane one and added a Lofoten diesel heater that keeps the cabin cozy and a kettle hot. At first, the couple averaged 3.35 hours of generator time per day, so they set about identifying energy uses from the significant (an inefficient refrigeration system) to the minute (the clock on the microwave). They upgraded their house battery bank to six 55T25 825Ah deep-cycle cells, and switched from automotive-style regulators to an Ample Power smart regulator alternator to control and monitor charging. The refrigeration was tackled, as well, but more on that later. By 2007, their energy reduction goal resulted in a drop to 1.04 hours of genset time per day. David deemed that impressive, but not enough, so in 2008 he added a 520-watt Kyocera solar array. 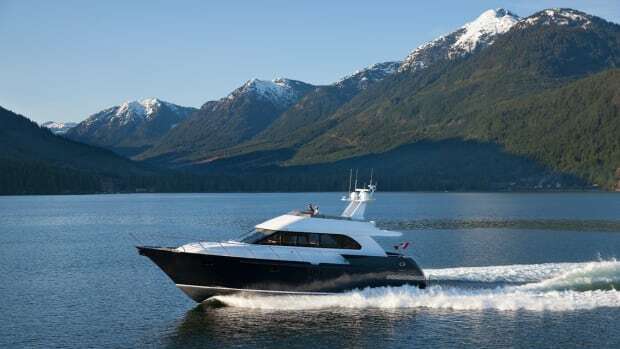 The panels lie flat on the pilothouse roof but could be manually angled toward the sun for peak charge rates of up to 38 amps per hour at 14.4 volts. By 2009, David observed that the boat was accumulating over 200Ah on sunny days, or the equivalent of the couple’s daily usage. In 2011, he added a Rutland 913 wind generator to assist with charging when the sun wasn’t shining. The genset runtime has dropped to .48 hours per day (mostly to generate hot water) which translates to 23 ½ hours of quiet comfort each day and energy self-sufficiency for a week or more at anchor. Success! Their quiet cruising was pierced one day when an alarm sounded on a fog-shrouded passage along Richardson Channel going up to Cape Caution. Close inspection revealed that the high bilge water alarm had been triggered by a leak in one of the copper freshwater lines. On another outing along the Kwakshua Channel, an alarm notified of high heat (although no fire) in the engine room. The refreshed instrument cluster in the helm. Rattled by alarms that signaled trouble but gave no indication which sensor was going off and why, David developed a do-it-yourself alarm system. With LEDs, resistors, diodes and color-coded wiring added to a standard alarm panel, David fashioned a custom alarm system that monitored all but the exhaust elbow. The modified panel, positioned by the pilothouse wheel, now provides information on the sensors and even has switches to override the system if no critical situation is detected. Peace of mind and silence can be restored. Ever focused on minimizing waste while optimizing convenience, David has tackled numerous other projects aboard. For example, he noticed that a large amount of water was wasted while waiting for hot water to reach the head sink. So he added a bypass to capture the cold water and return it to the tank. “It’s like having instant hot water now,” he says. 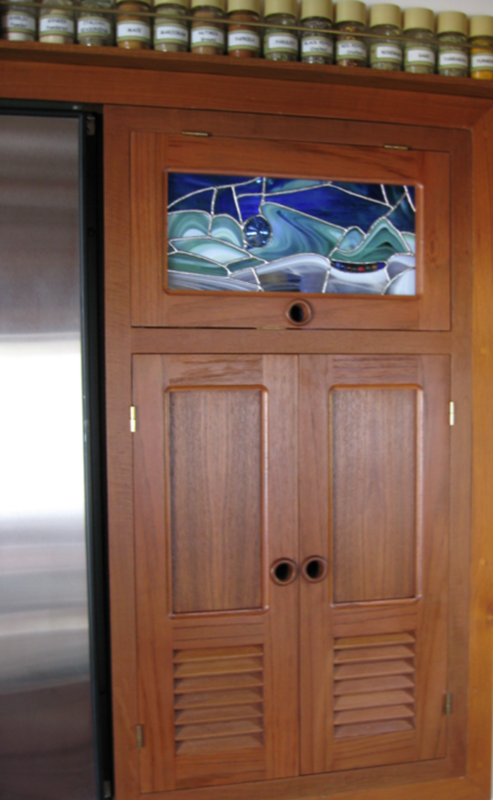 The couple added plenty of character to their cruiser with detail like this stained glass in the galley. David also hated the maintenance on the wooden swim platform, which was used for easy access to the dinghy, landing a fish or readying a crab trap. To solve this problem, he created PDF files with drawings of the stern to create a custom grid platform done in PlasTeak, a synthetic wood made of high-density polyethylene, or mostly recycled milk cartons. The whole thing cost less than $800, and in five years has required no maintenance other than occasionally hosing off algae or fish blood. It even afforded the extension of the engine exhaust pipe to reduce the soot on the transom. David donated the old platform to a Grand Banks owner at the marina, knowing he was now free of the tyranny of the brush. 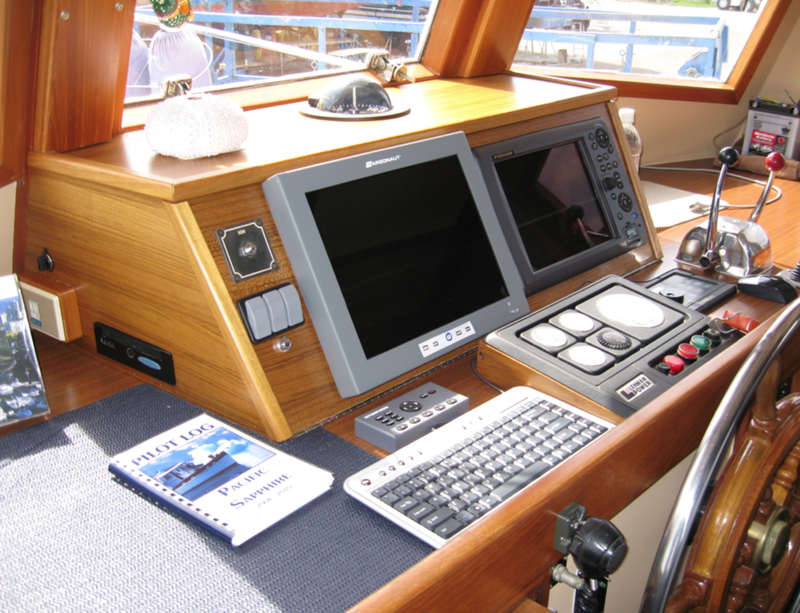 Another project was a complete revamp of the pilothouse electronics. The Krogen dash wasn’t conducive to mounting today’s large monitors, so an enclosure was built to house the new electronics and to organize everything, including the bow thruster joystick, the SE200 Interphase forward scanning sonar control pad and the on/off switch for the GE rearview camera, which comes in handy for tight docking situations. Never complacent, David is eyeing his next modification, which is to add a coil to the Lofoten stove so he doesn’t have to run the genset to make hot water. He expects to be done by the summer season launch. The heart of the vessel for David and Noreen is the galley, where their creative talents come alive. David admits he’s a seat-of-the pants guy when it comes to cooking; but Noreen, a retired physician and genetics specialist, is more methodical, preferring to follow and create recipes. A more orderly kitchen had to be developed to suit their needs. The AC Sub-Zero fridge and freezer operated off the inverter and was a true energy hog. After a false start with a 12-volt Danfoss system conversion, David settled on a side-by-side fridge and freezer (Nova Kool RF7501), with better insulation between the compressor and the cool box. Down went the energy consumption. 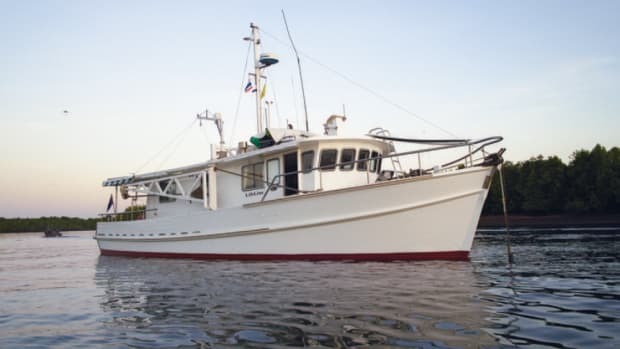 But the freezer was too small when large halibut, lingcod or coho salmon were caught, so David added a 110-volt, 3.6-cubic-foot chest freezer on the afterdeck. Up went the energy needs until he added good ventilation below the unit and an insulated top so the freezer can be turned off at night when it is not opened. That made the whole system more manageable, and the fact that it is identical to the one they have at home makes it easy to move food packs between the two. The exterior of Pacific Sapphire is capped with solar panels. The restructuring of the fridge left extra space in the rear of the cabinetry, so a custom pantry locker was added and drawers were extended so they could hold long knives and other large kitchen tools. They even found room for a 40-container spice rack, so along with the new twin sinks, embedded into new Corian countertops, the galley is now a place where magic happens. 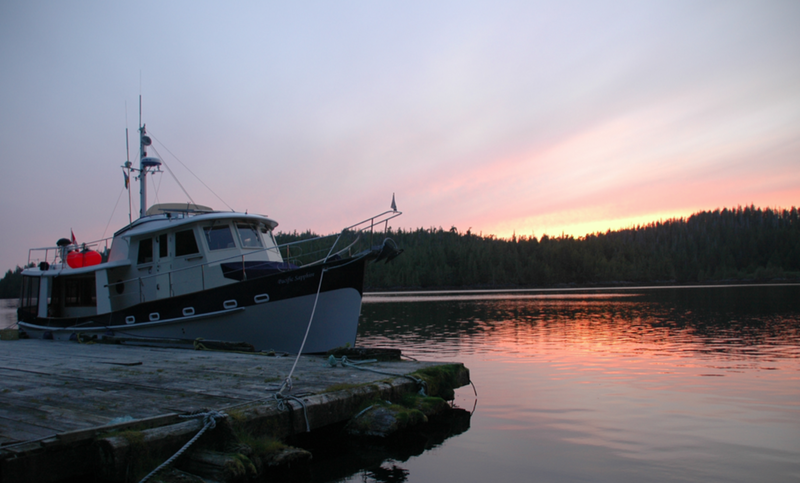 David and Noreen have put more than 50,000 miles under their keel, nearly half of which were done on their customized Krogen 42. They have stretched as far as Alaska on four trips in odd-numbered years since 2007. 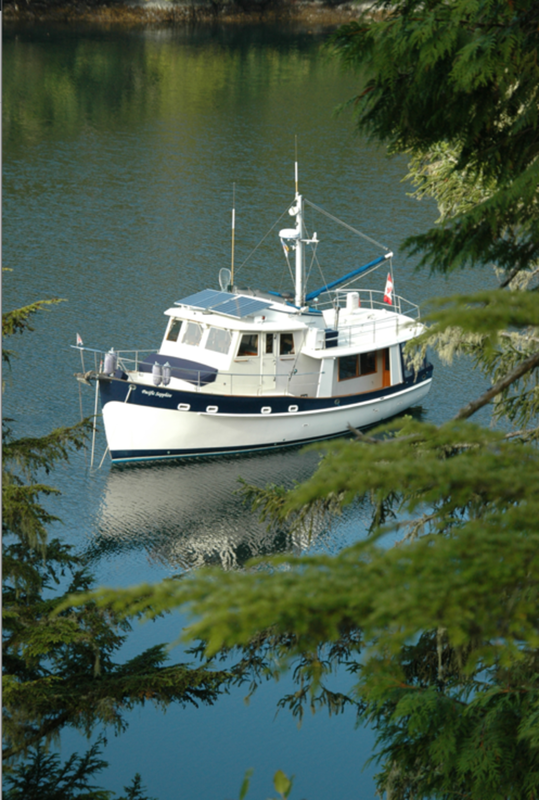 They have also circumnavigated Vancouver Island, motored from Cape Flattery to Glacier Bay and visited Haida Gwaii, also known as the Queen Charlotte Islands archipelago. Their world is filled with whale, wolf, grizzly and deer sightings, where, if you sit still and quiet long enough, something is bound to surface or come down to the water to fish. David describes his desire to visit the Great Bear Rainforest, a temperate forest on the British Columbia coast between Vancouver Island and southeast Alaska. It is home to Kermode bears, also known as Spirit Bears. These are white bears that are a result of a recessive gene among the local black bears. Amounting to approximately ten percent of the black bear population (or about 400 in total), these white animals are rare and revered, and most likely completely irresistible to a pair of geneticists. 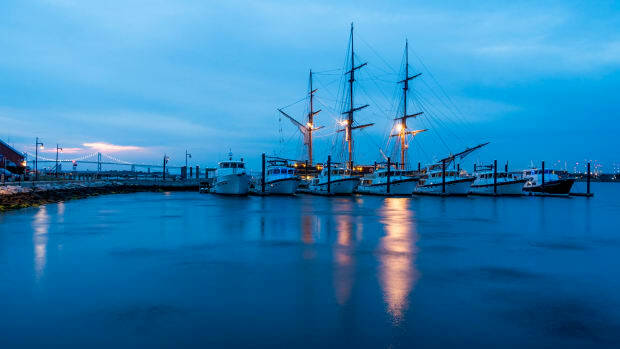 To paraphrase Virginia Wolf, one cannot think well or sleep well if one has not dined well, and it sounds like all of the above are done exceptionally well aboard Pacific Sapphire. Any cruiser or foodie would feel right at home aboard, not to mention each could probably learn a thing or two from David and Noreen, with whom every remote voyage translates into a culinary adventure. Whether the daily menu includes freshly caught prawns, homemade bread, or chocolate pudding made with kelp, Pacific Sapphire is truly a moveable feast. So, about that dinner.